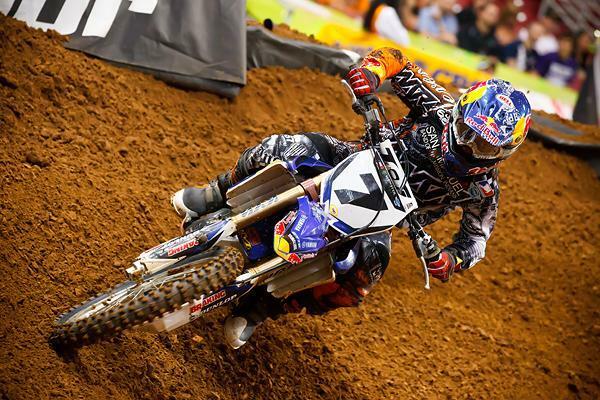 James Stewart is back. Well, at least back in victory lane. After nine weeks and eight races worth of set backs—the longest streak of races without a win that Stewart has ever endured—he finally grabbed the win on Saturday night in St. Louis. Two plus months of bad news, crashes, run ins and mishaps had really taken a toll on Stewart, so when he finally got to the top of the podium, he became overcome with emotion and started to cry. He collected himself later, and we talked to him for this week’s Alpinestars Monday Conversation. 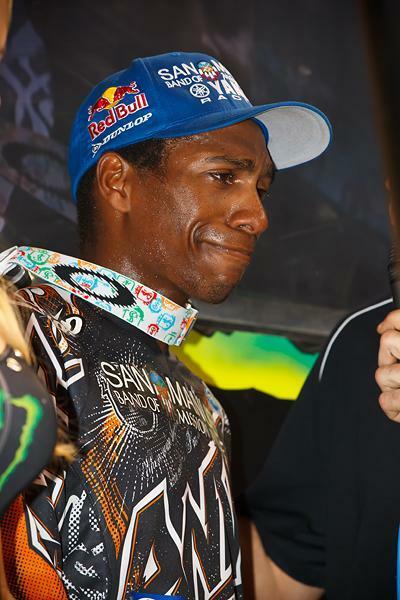 Racer X Online: You won almost 100 races since you turned pro. Where does this one rank? 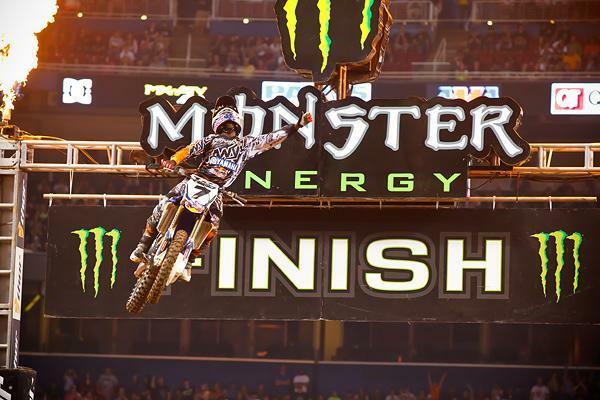 James Stewart: Probably the highest. Just to win, you know. Everything I’ve been going through on and off the race track. I’ve just been getting so many phone calls, from my friends and family to my sponsors, and not just recently, but from Daytona, Jacksonville, they were just calling me to say, “Hey we’re still behind you.” And the team is just there for me every weekend. That’s big when you’re going through this, and it just hit me on the podium, I couldn’t hold it in. And just to see my dad’s face, I could tell he wanted to cry. He just had a straight face, so I knew. It was cool. Just really cool. I know when you get to the racetrack you guys are in your element, because you grew up doing this. But was it even possible these last two months to completely focus on racing? It’s obviously been a tough two months. Were things getting to you? No, I think I do a good job when I’m racing to just focus on what I’m doing. But when I hit the ground, that’s when it really gets you. And I’m just continuing that each week. No matter what happened the week before, even if I don’t ride during the week, I still try to show up and ride and try to win and give it my best. And I think I have. It’s just, I’ve had bad luck, or, I shouldn’t even say that—I’ve just had things not go right. So at this one to come out and get a win, and to do it where I almost had time to enjoy it, because we didn’t have a lot of stuff going on [during the race] and I wasn’t too pressured. I was just having a good time. I was just so stoked. I know one thing that guys at your level hate is, when they don’t win, everyone asks them “What happened? What’s wrong?” Have you been dealing with that? Yeah, for sure. Like I said, I had people supporting me, win or lose, and they just want to help, win or lose. So they’d be looking at me, and I’d just tell them “I don’t know! I don’t know what is happening right now. I’m trying my hardest.” It goes down to everybody, so it means so much to get a win, for me and for the team. Things are changing [with the team] and I want those guys to know that I’m always going to give them 100 percent, win or lose. But I think they know that, but it feels good to show them with a win. Stewart picked up his first win since A2 this past weekend in St. Louis. What’s it like to be in a championship fight like this? You’re totally in it now, and you were never totally out of it. But this is not the way anyone predicted this season would go for anybody. No. Walking into Anaheim, I would have never thought things would be this close. I was coming back and feeling pretty good. But things went wrong. It is what it is, and at this point, I don’t even care. My dad was talking about the championship and I was like, “Dad, I don’t even care. I just want to get a win. Just let me win a race first.” For me, it’s a whole different feeling coming to the races [after the win]. It’s a whole different feeling being on that plane tonight. A whole different feeling tomorrow, and when I watch the race. You know, everyone sees me at the races, or watching them on TV, or watching Bubba’s World, and they see me smiling all the time and being super happy. But they don’t see me when I show up at the practice track, and I’m trying. I’m giving it everything I’ve got. And I’d be walking away [from the races] saying, “I gave it everything I got but it just wasn’t enough tonight.” I think that’s what you saw on the podium here. Finally, I rode way easier than I did the last seven races and I won. It was good. Let’s talk about this race. Did you purposely ride easier, or did it just come to you? Did you change anything? We went back to an old setup, the Anaheim 2 setup. I was comfortable from the start. And the track was pretty technical tonight, it wasn’t a freeway. Actually, I’m bummed because they changed that section over there—I was really fast through there. And I had this other section [triple-triple in the rhythm lane] in my back pocket, I didn’t even know if I could jump it or not. But I was like, what the heck, things haven’t been going good for you anyway, so you might as well go for it. I did it and it was pretty easy. The track was pretty good tonight, and like I said, sometimes when you don’t try as hard, you win. Yeah but you know who crashed in that section and caused them to change it, right? Your brother! Yeah and I was pissed [laughs]. I was like, “Dude, what are you doing? You’re not trying to help!” It wasn’t even him, some guys were complaining about it. For me, it’s hard, because they set rules, and I understand things were dangerous so they had to do it, but it’s hard to change things in timed practice. When you read the rulebook, and you can’t change it, I’ve had things where I’m like, “Hey can you change it?” and they’re like “No, we can’t.” Then I go good through there and other guys go good, and then they change it. But it doesn’t matter, I still won the race. I don’t think one little jump would have changed the race anyway so it’s all good. Last thing. You and I have talked about this many times. You’re under so much more scrutiny than most people can understand, and probably more than most racers can understand. You’re aware of that. Yeah, and like I’ve said before, it was hard for me to accept earlier in my career. But lately, it wasn’t even criticism getting to me. I didn’t care about that. I was just like, man, I wanted to win. I wanted to do right for my friends and family and my team. And I felt like it was going to be a special night tonight. We had some new graphics on the bike, so the bike was shined up and looking nice, Answer supplied me with the best looking gear I’ve ever had in my life. So it was just a good night for me.